When the scallops are done, set them aside in a warm bowl and cover with aluminum foil. Stir the garlic in to the pan juices and cook for about 15 seconds. Now, add the orange juice and stir together for about 30 seconds. Finally, add the triple sec and scrape up all of the fond from the bottom of the skillet. Simmer for 5-7 minutes or until the liquid reduces into a sauce. Sprinkle salt and pepper over the scallops and plate them. 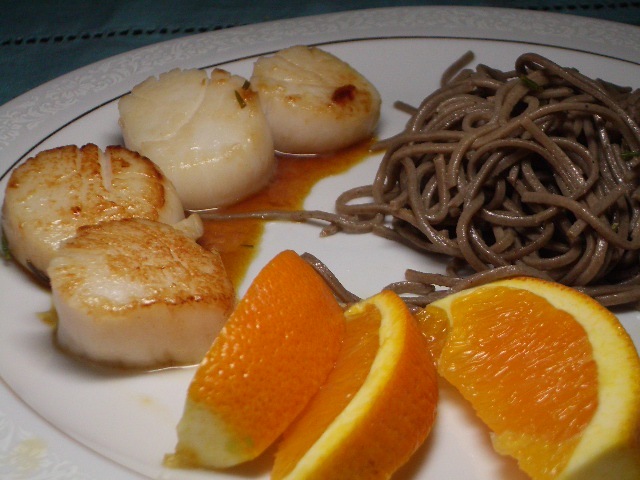 Lightly drizzle the orange sauce over the scallops, serve, and ENJOY! **we adapted this recipe from this site.